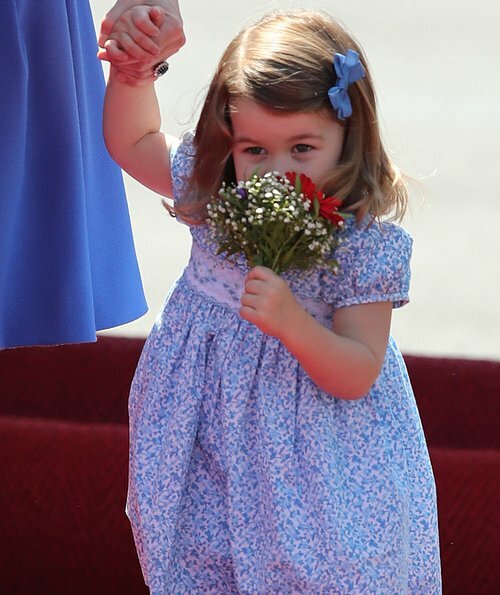 Princess Charlotte looks so adorable with those flowers! They are beautiful family. 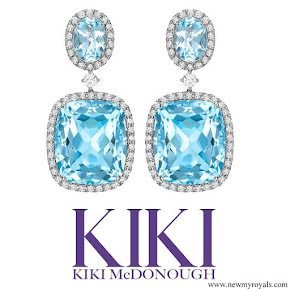 Perfect choice with cornflower blue. It is the symbol of Germany and Duchess looks radiant in this colour. Cornflower blue is the symbol of Germany?? Same Catherine Walker coat-dress as in Canada. Only a different volour. Boring Kate and boring fashion choises. Total agree!!!! Kate so boring and her fashion too!!!! Like a old woman! Excellent and thoughtful (color) arrival outfit. Feminine but professional. 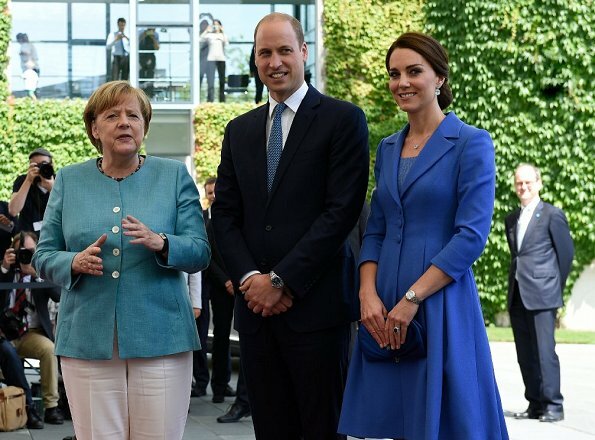 Very glad Kate has found her official look with Catherine Walker and Alexander McQueen. Let's not talk about Mrs. M.'s sense of fashion. Agreeee! Boring! Old lady style - Catherine Walker is for grandmothers! Thank goodness for the children... too much colour coordination!!!! This is a lovely look. Beautiful colour and style. 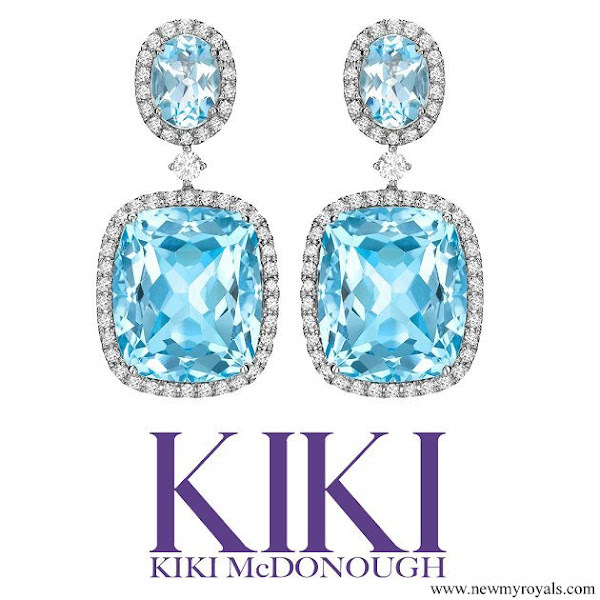 Hair up and tidy, and we can see the kiki McDonough earings, which are gorgeous ! Charlotte seems happy with her own bouquet ! wat schattig die kindertjes, het is een leuk stel !!!! Sigh so boring, i cannot imagine a young person can feel good in this always the same kind of clothes. Great look. As Pine said above: feminine and professional. I can't see how it is boring or grandmotherly. Charlotte is such a little doll. So cute with the flowers. Very lovely shade of cornflower blue - Catherine has found a style that she feels comfortable with. I live the earring and the kids look cute. I am not bullying anyone, i just don't like Kate's clothes now and than because they are very boring sometimes. Why should i fake my opinion in order to please other people? OK - thanks, I kind of got the idea but wasn't totally sure. Monty, I don't see the mobbing or bullying culture you mention. The comments up to yours are pretty evenly divided - some who like Kate's look, some who do not. The comments all pertain to her fashion and style, and there are no negative comments about her, personally. I hope I am not missing something, but I find this blog to be candid, not mean-spirited. That is just my opinion. Monty, I think I understand what you mean. The former Kate Middleton and now Duchess Catherine is not just some royal. She is definitely one of the most famous women in the world. More than two billions people watched her wedding on TV. So I think she evokes a lot of emotions, from positive emotions to mixed emotions and bad ones. Duchess Catherine is a projection surface. So matronly and coordination overkill. Kids are still cute though. Color coordination is cute... The first time. 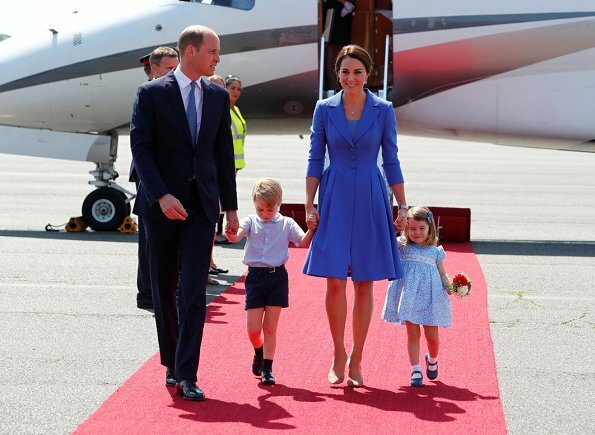 What's up with the royal families showing up wearing all blue?? I notice the swedish royal family also does that a lot. I suppose this color of blue (it is called Prussian blue, I believe?) looks good on just about anyone, but it really complements Kate. Again, I do not mind this version of her "uniform"- it's fresh, modest and flattering. 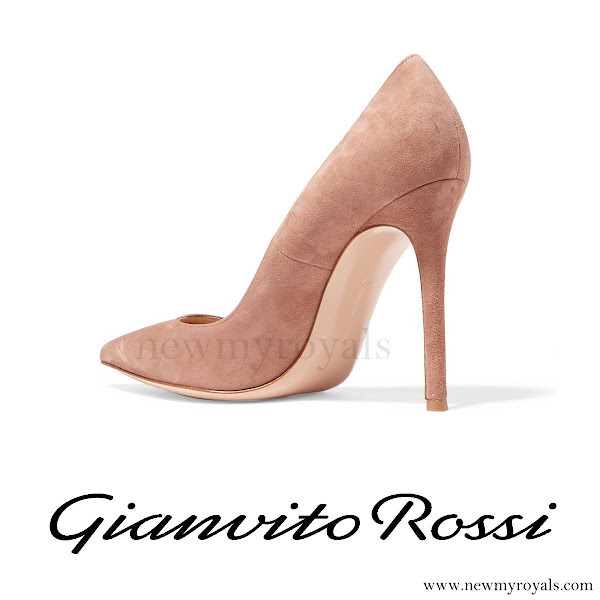 Perfect for a Duchess on official visit. She looks very well put together, the color and fit is very lovely. William is wearing a matching tie (like Felipe and Letizia). 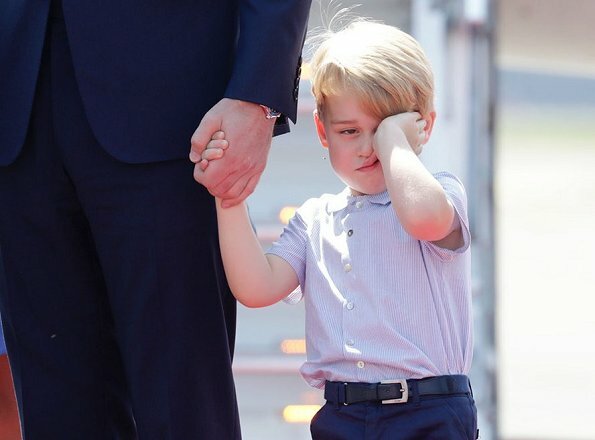 The little girl is adorable and is wearing a very pretty dress, and the little boy seems tired and doesn't seem to enjoy having his dad holding his hand all the time. Very nice family. 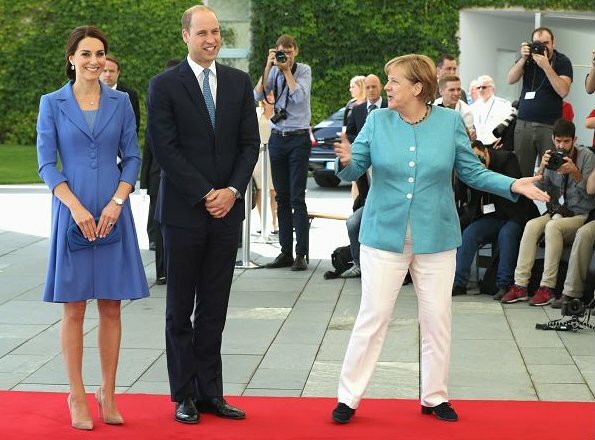 Mrs. Merkel reminds me of Hillary, both always wear awful pantsuits. The WOW look of the Duchess. Colour just enhance how beautiful the Duchess really is. Charlotte is gorgeous. I love how she is dressed. George looks tired and bored which is totally understandable. I love this colour on Kate, it brightens her complexion, it makes her look fresh and young, her hair looks great. I also think her shoes and clutch look great and Kate it amassing some stunning jewellery. Sadly I don't like the outfit itself, the shoulders seem too boxy and the lapels too wide but despite this, the overall effect is a radiant Kate so I have to give this look a thumbs up!